New Labour's objectives for public services and the welfare state are cloaked in the rhetoric of the Third Way. Some of the objectives are hidden behind public statements proclaiming 'what matters is what works', and agreeable but vague statements about 'modernisation' and 'renewal'. 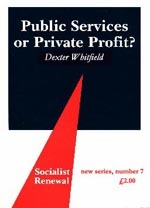 Dexter Whitfield analyses how the Blair Project promotes private finance and the marketisation of public services, and exposes how the Third Way masks its continuance of Thatcherism.